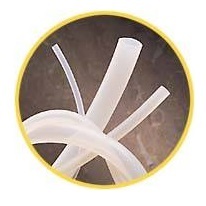 Surgical tubing is frequently made from silicone or latex, and each material has its own benefits and disadvantages. Surgical Tubing – NewAge® Industries, Inc.
Silicone is an inert compound, meaning that it is generally non-reactive when brought into contact with other substances. It has a better deterioration rate than latex, can resist extreme temperatures and is very elastic. It does not maintain its shape memory well; if it is stretched, it will not shrink back to its original length but remain elongated. Latex tubing is very stretchy and has exceptionally strong gripping power. It will return to its original shape after being pulled, twisted or stretched. The walls of surgical tubing are generally quite thin to allow a maximum flow of fluids without requiring a larger tube. Surgical tubing can be ordered as clear or colored as well as in varying lengths and diameters. It is used in oxygen, air, and fluid transfer and is indispensable for suction tubes, intravenous lines, tourniquets, catheters, and cardiac tubing. Besides its medical applications, surgical tubing is used in fishing for jigs and lures, slingshots and other various uses. Natural gum rubber comes from natural latex, which is a milky substance found in many plant species, most notably the Pará rubber tree. Synthetic rubber comes from petroleum-derived chemicals. Variations in materials and these chemicals result in different characteristics of the final product. Silicone tubing, for example, is very smooth, whereas neoprene tubing is particularly abrasion resistant. Durability, tensile strength and temperature limits are other common tubing attributes that can be attained through certain additives. Dyes are added at this point; some rubbers accept the color better than others, but coloration does not affect the performance of the tube itself. Surgical tubes are usually clear, tan or amber for visual evaluation. Once the rubber is mixed, it is molded, extruded or dipped to be given its shape. Extrusion is a process in which raw rubber materials are forced through an extrusion die. Dipping involves long thin cylinders called mandrels that get dipped in liquid rubber; the rubber is steam cured directly on the mandrels then removed. This process also results in a smooth, seamless tube with no weak areas. Because surgical tubing is used in clean room and sterile environments, it is disinfected by dry heat, gamma radiation or chemical treating. 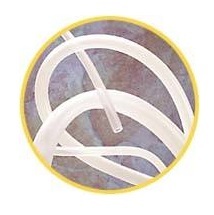 Surgical Tubing Surgical tubing is used in sterile and medical environments to provide a flow path for liquids and gases. It can be made from natural or synthetic rubber.